Purpose: Use this document as a reference for copying a Purchase Order from an existing Purchase Order in ctcLink. 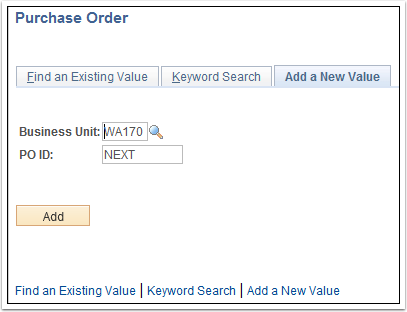 On the Purchase Order page use the Copy From drop-down button to select the Purchase Order option. Enter or select the PO number in the PO ID field of the PO from which you want to copy. Select the Select checkbox for the PO ID. Click the OK button to acknowledge the message letting you know that you are copying. Click the OK button to acknowledge the second message regarding the taxes. Review the new PO to ensure that you don’t have any adjustments to quantities or pricing. Click the Save button to create the new PO. Note: The PO ID field now has the PO number assignment.